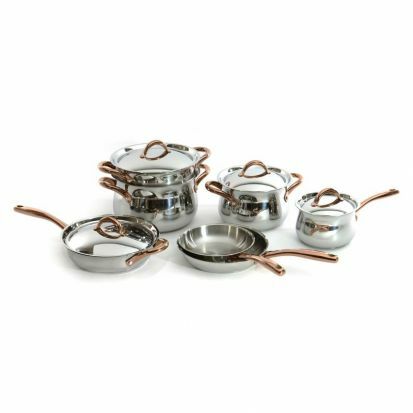 The Berghoff 11-piece cookware set is comprised of high quality and high performance pots and pans for all your essential cooking needs. Made with top quality 18/10 stainless steel, the pans are durable as well as beautiful. The base is multi-layered and offers an even heat distribution ensuring great results and energy efficient performance. The large, riveted copper-coloured handles are easy to grip and control, and they also add to the pots' already stunning aesthetic. The tight fitting lids also ensure your meal retains as much moisture and flavour as is possible. The set consists of a 16cm saucepan and lid, a 20cm casserole with lid, a 24cm stockpot with lid, a 24cm deep skillet with lid and helper handle, a 20cm frying pan, a 24cm frying pan, and a 24cm steamer insert which fits into the stockpot to create a steam cooker.